Since childhood, friends Moeka and Misaki have dreamed of joining the Blue Mermaids, an all-female marine defense/patrol force. On their first day at Yokosuka Marine School, Misaki accidentally knocks a haughty girl into the water. The two friends are assigned to different training ships, but are both given the role of “captain”. The haughty girl, Mashiro, turns out to be Misaki’s deputy captain aboard the Harekaze. The ships immediately set sail for a two week hands on nautical training program. Misaki gets to know various members of her crew. However, because of her laid back attitude, they are late to their first training session, sparking further conflict with Mashiro. Because of their lateness, the teacher’s ship fires on the Harekaze. 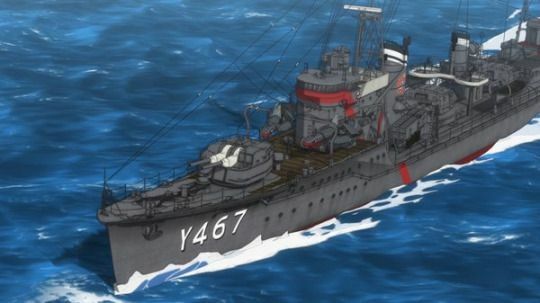 In order to protect her crew, Misaki fires a torpedo back, distracting the teacher’s ship long enough for the Harekaze to escape. They get a call on the radio informing them that, as a result of their attack, their ship is considered to have “mutinied”. HaiFuri has one of those premises that, in my opinion, requires a little too much suspension of disbelief. A coast guard consisting entirely of women is fine, but one that recruits high school girls who are then put immediately onto massive battleships and required to crew them with minimal adult supervision? Not to mention that, despite working on huge ships, the girls still wear short-skirted school uniforms. So wacky and interesting, am I right? Well…not really. 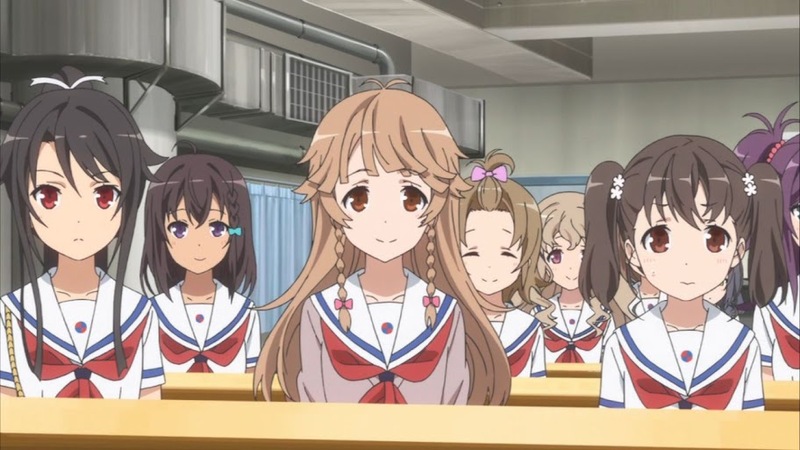 The first fifteen minutes or so of HaiFuri were extremely boring. It felt like just another “cute girls doing cute things” show with a slight nautical twist. I could barely keep my eyes open, and I LOVE boats and sailing! 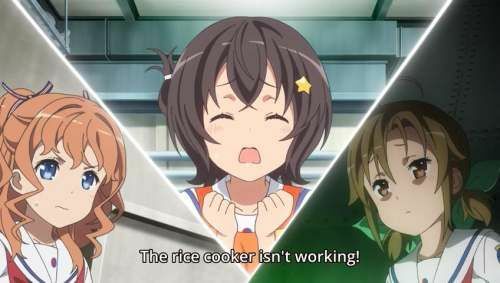 Plus, none of the girls besides Misaki and Mashiro got any development beyond a brief introduction, and I certainly couldn’t keep track of them (though I did like the ship’s cook who kept freaking out about the broken rice cooker). …Wait, how is this the students’ fault? Also, firing on your own students’ ship just because they were tardy seems like, uh… disproportionate punishment? I’ve seen two episodes now, and without spoiling anything else I’ll say that the ‘mutiny’ situation is not at all resolved in episode 2, but actually the end of episode 2 escalates the situation by another level. 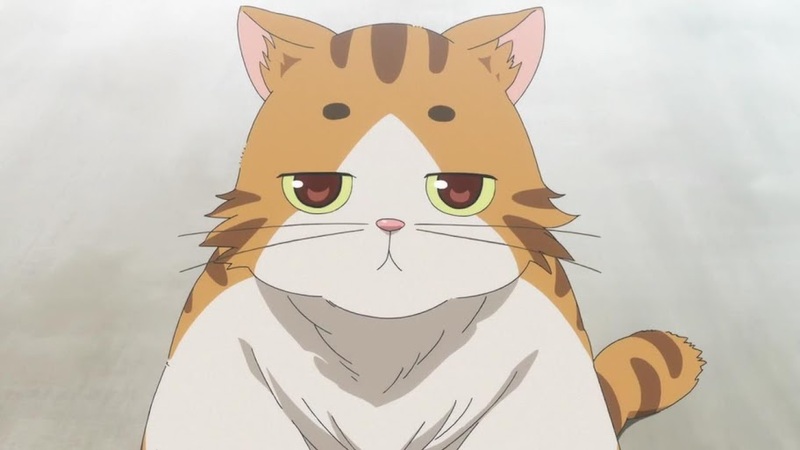 It’s still definitely a show of cute girls being cute, which is not my cup of tea, but it definitely has my interest after the second episode and at this point I feel certain that I’ll be watching the full season.